Everyday Hockey Heroes contains a collection of stories from inspiring men and women inside the world of hockey, on and off the ice. I received an advance copy from the publisher in exchange for an honest review. 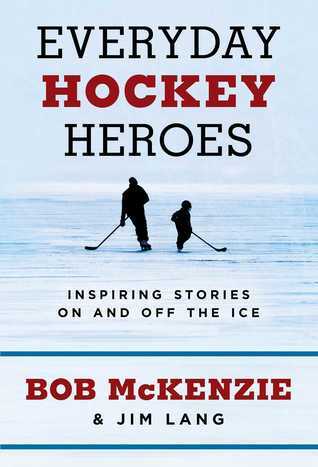 Much like Bob’s previous hockey book, Everyday Hockey Heroes is broken up into individual sections featuring a different subject or personality involved in the game. Each story tells of how the game either helped them or how they used their experience to help others. There are several feel good stories about players who received unconditional support from their community in the face of hardship allowing them to excel in something they loved. The book also ventures outside of the realm of the player and into the medical field with stories from doctors at the forefront of sports injury and recovery research. It also looks at commentators who broke down barriers to be able to call the action on the ice. There’s a veritable cornucopia of hockey chronicles in this book. I don’t want to say that I didn’t like this book, but it certainly didn’t do a whole lot for me. The people profiled are both important to the game as well as the fight for inclusion, but because the stories are so short, they lack substance and more or less feel like fluff pieces. Being released in October likely means the publisher is marketing the book as a great Christmas gift for hockey fans. Unfortunately, there are other better books out there to stuff in a stocking.